September begins and with that we begin with the second month long marathon of the year , the first being in April . Yes we have two Mega Marathons every year , one in April and the other in September . We have been doing these marathons over a period of time now , under Valli’s leadership . April 2017 – A – Z Baking Around the World – Re-cap,26 Egg less Cakes! For this September the theme is Flatbreads and More . When we talk of Flatbreads we have to categorise them , and hence we had three options to choose from . 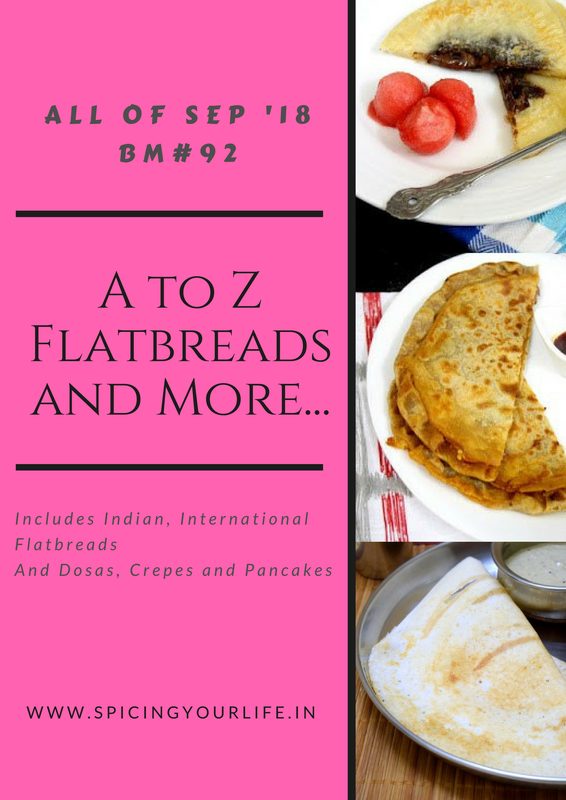 Three where we post A to Z Indian Breads . This would include Dosa’s , Crepes and Pancakes . I have chosen to make A to Z Indian Flatbreads . I have tried my best to stick to the traditional recipes , but yes there are a couple of alphabets for which I had to to work on fusion or regular recipes. Hoping that you guys will enjoy these recipes as much as I enjoyed making and eating them .